Do some stores, like trendy American Apparel, have more right to be in Downtown Silver Spring than others? Last week, I attended the City of Takoma Park's unveiling of The New Ave, a website and marketing campaign for the New Hampshire Avenue corridor. Officials from the city and Montgomery and Prince George's counties took a bus tour of the area, followed by a visit to two local businesses. As Mayor Bruce Williams held a photo op outside El Alazan Western Wear, which sells cowboy-themed clothes to the Latino population, a black guy in an SUV drove by. "Are y'all doing anything to stop the Latinos from pushing everybody else out?" he yelled. East County has a slew of small businesses, from auto shops, to Indian groceries to a pirate-themed restaurant. And they all have small clienteles, whether it's neighborhood residents who need their car fixed, Indian immigrants, or people who like to wear eye patches and sing sea shanties. (Sign me up for all three.) There are also people who feel "pushed out" by these businesses, frustrated or angry that their specific needs aren't being served by them and wondering if they deserve a place in the community. There are a lot of awesome local businesses in East County that I patronize and support, and plenty more that I don't. But that doesn't mean they don't benefit me or anyone else. There are six Dominican hair salons in Downtown Silver Spring, patronized by Latinos and blacks who share the same the nappy hair (like my own) that is native to the Dominican Republic. If you have straight hair, these places are useless to you. But they still pay County taxes, provide customers for other businesses both local and chains, and keep the sidewalks busy and safe. 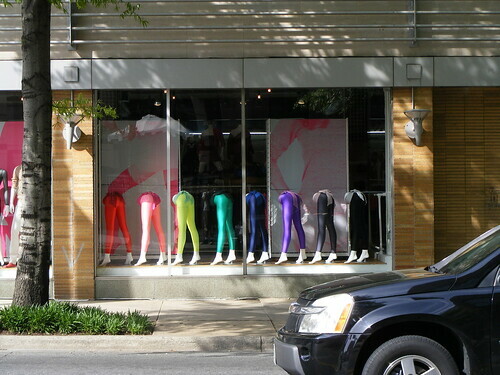 Why push them out just to bring in some trendy, upscale retailer? Who says one deserves to be in the "new" Silver Spring more than the other, or that they couldn't coexist? 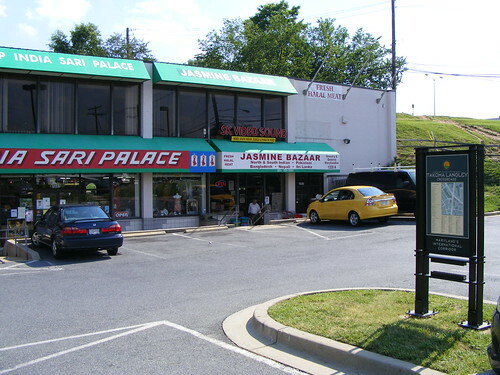 Indian businesses at a shopping center near "The New Ave" in Takoma Park. The store that sells bootleg Ghanel T-shirts in City Place is as significant to Downtown as the American Apparel across the street. They both have their clienteles. They might even have some of the same customers! But one somehow appears more favorable than the other. We can't dictate who should or shouldn't set up shop in the CBD, because every time the market will prove us wrong. City Place Mall had a Nordstrom Rack fifteen years ago, which closed due to poor sales and very different demographics than they'd planned for. That store would probably do much better today, primed by the higher-spending crowds on Ellsworth Drive. The people who come to Downtown Silver Spring are a mix of rich and poor, hip and unhip, white, black and everything in between. And they need stores as diverse as they are. We need chains to anchor the locals and we need the locals - all of them - to serve their niche audiences. The more we've got to offer here, the more reasons people have to come to Silver Spring and the more reasons we don't have to commute elsewhere in MoCo or the region to spend money. As far as I'm concerned, "local" can always mean "good", because local businesses can support the economy and draw more traffic to Downtown Silver Spring and commercial districts throughout East County, whether you personally benefit from them or not. Last week, Silver Spring, Singular suggested I should be giving tours of Burtonsville strip malls; when I do, he might want to join me. Anyone who's ventured above the Beltway knows that there's a really awesome "Restaurant Row" forming along Route 198, with Coffee Oromia Soretti's Ethiopian Cuisine, Old Hickory Grille and Cuba de Ayer. Hopefully, they'll be joined by a mix of local and national merchants in the new Burtonsville Town Square shopping center, lifting up another East County business district that can benefit from more - not less - diversity. Dan: I have nothing against Dominicans or the businesses that cater to their hair-care needs, but I think your post misses the point. Nobody has suggested that national chains have any more "right" to locate in East County than local retailers and restaurants. The real question is how to respond when the locals (or more specifically, local businesses that cater to a relatively downscale clientele) complain that they are getting pushed out by the nationals (or locals whose target market is more affluent). In my view, many of the merchants who have complained that they have not seen the benefits of the county's investment in revitalizing Silver Spring have failed to adapt to the opportunities presented by an influx of more affluent residents and visitors (and a larger number of prospective customers more generally, at every income level). I like to see local businesses succeed -- and many have. But some of the businesses along Georgia and in City Place Mall are going to fail for good reason: they are offering crappy merchandise, poor service, bad food, etc., and a revitalized central business district means that their customers have better choices nearby -- whether these choices are "local" or "national." > from pushing everybody else out?" he yelled. Dan, you're missing the point of what that man is saying. I realize that you almost certainly don't identify with the "always been here" black folks. I don't exactly identify with them since that would be silly, given my appearance. Yet I have had friends in that community since I was bussed to Farquahar Middle School when it first opened, and having learned young how to get along -- mostly you just have to listen to honesty and give back honesty and everyone will have and get respect -- I have done my best to keep in practice at getting along. I know a lot of "always been here" black folks, especially downtown, who are particularly annoyed because right as the Contract With America ended the establishment of "Welfare as We Know It", even as the five-year lifetime limit was reached by almost everyone on Welfare, the country was allowed to be flooded with illegal aliens and "temporary protected refugees". And the government and the media wated no effort to sing the praises. If you think it's easy to be a poor black man who is caught on the one side by being raised in a large family by a single mom, and on the other side caught in the violence of poverty with a life-expectancy median of 50-50 dead at 18 years (SE DC in 1998), and also with a 1 in 4 chance that you'll be in the Federal prison system by age 25... now add to that the fact that the Rich Republicans are flooding the country with people who specialize in taking the only jobs you're likely to qualify for, and the Democrats are all talking about how "hardworking the Latinos are, unlike some people" as they look down their noses in your direction. Well, you personally were lucky because you were gifted and talented and also didn't get gunned down in the ghetto like so many honor students, like poor Tai Lam. But the average kid growing up in the Projects at 5th and E SouthEast isn't you and doesn't have your ability to rise above very strong odds stacked against. And right when Welfare ends, the country suddenly is filled to overflowing and all of the scant money that used to go to Great Society/Grand Society uplift projects now go all to the Latino -- because they are so "hardworking" -- and the black man gets nothing except cops on his trail, the sheriff with the evictions at the door, and the advice at every McDonalds in the country: "we only hire people who are bilingual English/Spanish". And when I talk to the black folks down in the District, I hear "they are pushing us all out". I hear it when I talk to black folks out here in MoCo, at least from the "always been here" black folks who haven't managed to make it through getting a degree. I suppose this makes me some sort of terrible racist, but I believe that the USA -- for historical reasons you probably have heard of -- owes more to the descendants of the slaves than it owes to "temporary protected refugees" from a war that was over for ten years before these "refugees" began arriving in any numbers. So, if there are going to be any subsidies, let's have them go to historically disadvantaged AMERICAN minorities such as blacks, Native Americans from nations with which the US has treaties and formal recognition, women, and the disabled. Promote those who have the greatest historical claim and right to promotion. Anyone else who wants to come to American to take their chances should sink or swim on their own weight. In fact, that's what the law requires, not that MoCo gives a damn about Federal law.